David Ito Arquitetura’s primary task when designing the interior was to create a generous area for entertaining, which maximises the building’s winter garden with floor-to-ceiling glazing. “Meeting the residents’ desire to obtain large spaces in a light atmosphere, using delicate colours, this project seeks to value two important characteristics of the apartment: its great natural light and its large social area,” said the team. Between the glass curtain wall and a set of sliding doors, a lounge and a bar take up the prime position among plenty of foliage. 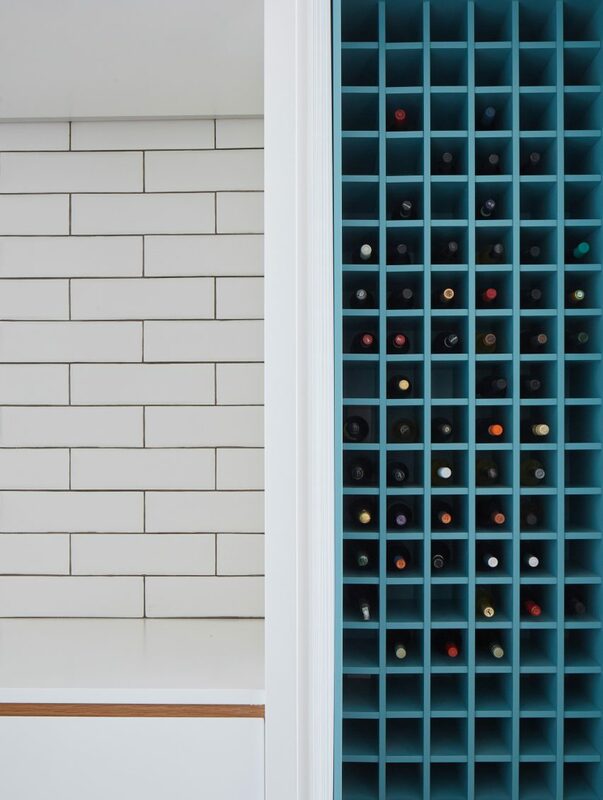 Patterned tiles highlight the wall behind the high counter, with light blue tones also picked out in throw cushions. A living and dining room through the retractable partition is more formal. In the centre, a block includes two sofas that face in opposite directions: one towards a fireplace and the other overlooking a larger sitting and eating area. The entire back wall is covered in white panels striped with vertical grooves. These surround the doorway from the wood-lined the elevator vestibule and hide storage areas. “The 12-metre-long ripped panel acts as a backdrop for all the social area,” said the architects. 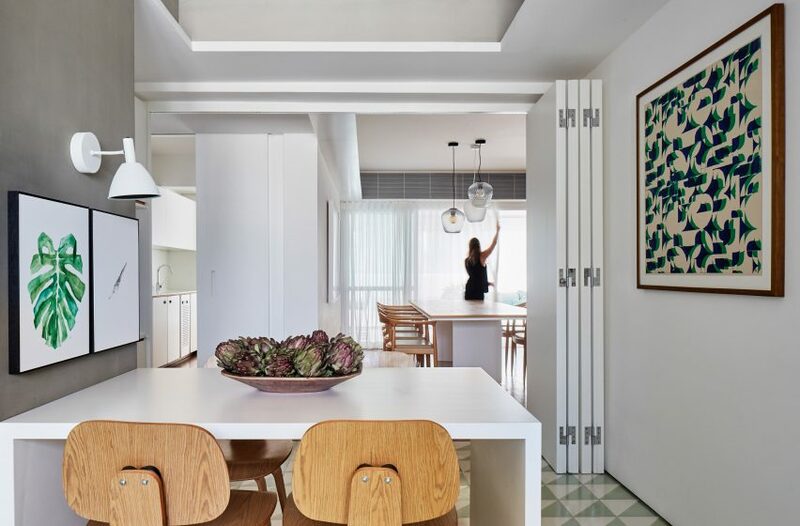 At the end closest to the dining table, the panels concertina open to reveal the kitchen, where the wooden flooring gives way to patterned green tiles. The remainder of the 260-square-metre apartment is also located on this side of the panelling. The layout includes three small bedrooms with en-suites – one of which is used as a study – and a larger master suite. The neutrally decorated main bedroom is accessed through a dressing room, which has a stack of blue drawers in the middle and a built-in wooden vanity unit across one wall. “The identity of the social area permeates the intimate wing, emphasising the furniture for underwear in the closet, which has small colourful pivot doors alluding to the magic cube,” said David Ito Arquitetura. Furniture across the residence is a mix of mid-century and contemporary – from dining chairs designed by Danish modernist Hans J Wegner to lighting fixtures by Samuel Wilkinson. White walls and timber panels are used throughout, providing a backdrop for several colourful accent pieces. “The white surfaces are differentiated by their textures and reflections, and together with all the wood used, they form the ideal base to receive the desired colours,” David Ito Arquitetura said. 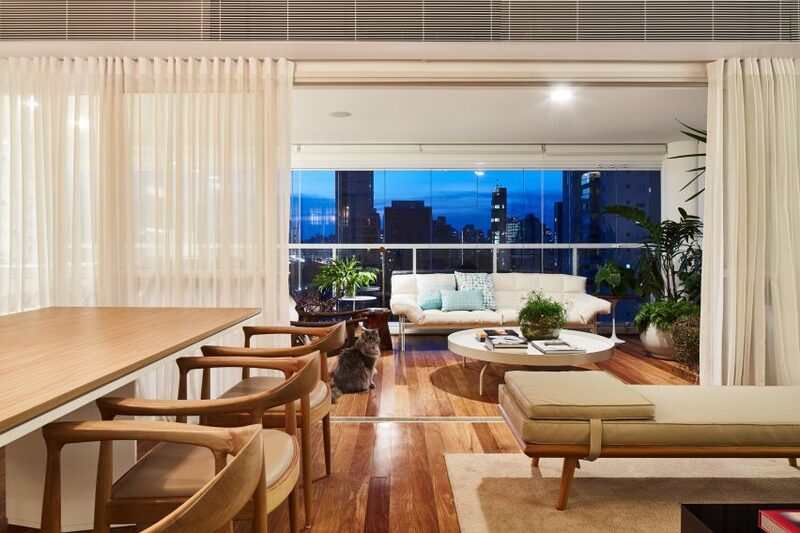 São Paulo’s hundreds of residential towers accommodate apartments of all shapes and sizes, including a compact home with a flexible layout by TRIA Arquitetura and a huge penthouse with double-height walls by Studio MK27. Team: David Ito, Martin Naf, Victor Hertel, Lucas Anghinoni, Victória Calil, Natasha Tavolaro.